In 1999 the Glanville family approached the Commission for assistance in locating a triptych looted from their home in Vienna when the family fled the Nazis in 1938. 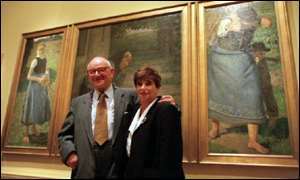 Marietta Glanville described the looted painting as "an icon of my childhood." Her mother, Elizabeth Glanville, had searched for the looted von Kalckreuth painting since 1948. In 1971 she learned that the painting was in the Bavarian State Paintings Collection, Munich which had acquired it from a private collector in 1942. But, in the same year, her claim was denied by the Bavarian Compensation Office on the grounds that the deadlines for restitution had expired in 1948. In 1983 Elizabeth Glanville died without having been able to recover her painting. 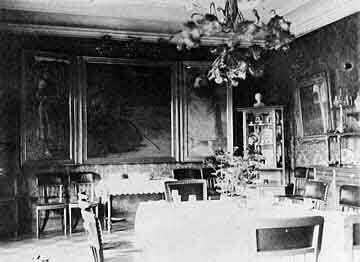 in the Glanville family dinning room in the 1930s. The Commission swiftly established that the work was in the possession of the Neue Pinakothek in Munich. After historical and archival research, which provided irrefutable grounds for restitution, the Commission was able to submit a claim to the Bavarian authorities in December 1999. At the same time, the painting was discovered on loan to the Royal Academy London for their show 1900: Art at the Crossroads. Nonetheless, by March 2000, only ten weeks later, the return of the painting was finalised and the family expressed its wish that it should stay in the exhibition through its tour to the Guggenheim Museum in New York. At a ceremony in London on 13 March 2000, Dr Reinhold Baumstark, Director General of the Bavarian State Paintings Collection, formally handed the picture back, saying: "We are very pleased to give the painting back and to do a little bit of justice after the injustice of all these years." Since 2000 the Commission has achieved the restitution of a number of other paintings from this family's collection.